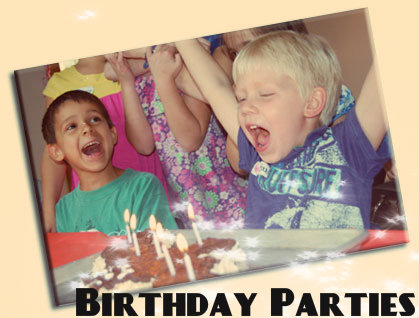 Our music themed birthday parties are a great way to celebrate your child’s birthday. We bring the same high-energy fun found in our classes to our birthday parties! Our parties are 2 hours long and include exclusive use of our Performance Hall at one of our Creative Soul Facilities. You get our undivided attention with a personal party coordinator, and special gift music themed party favor bags for each child & the birthday. For more information or to schedule a party, call us at one of our location offices at Fort Worth (817) 677-8506, Keller/Watauga (817) 485-7464, or Southlake (817) 764-1074 or email us at info@creativesoulmusic.com. This party includes 45 minutes of musical fun in which a Makin’ Music performer will lead the children in songs, chants, and fingerplays using different musical instruments and props. Next comes fun party games, and finally, time for the birthday child and guests to enjoy cake and presents! Your party coordinator will help greet your guests, set-up your goodies and decorations, and manage your party. Cost: $275 for up to 12 children. $7/additional child. Your little rock stars will love this rockin' party! With the help of one of our band instructors, guests will be introduced to an instrument, learn an easy song, and even perform on our decked out stage with lights, a microphone, and a real drum set! (Guests free to bring their own instruments or just use ours.) **Drumsets, Microphones, amps, and keyboards provided. Cost: $275 for up to 8 children. $65 more for up to 12 children. A non-refundable $95 deposit is required to confirm a party date and time. The rest is due in full one week prior to your party date. We suggest booking your party at least 4 weeks in advance to ensure that your time and date are available. Parents and birthday child should arrive no more than 10 minutes early to greet their guests. Since there are several parties throughout the day, please make sure your guests arrive and are picked up on time. Parents provide cake, drinks, other food items and any other supplies (plates, napkins, utensils, candles, etc.) the day of the party. Party bag options are available.